ENDPOINT DATA. It’s often one of the most forgotten aspects of an enterprise data protection strategy. Yet, content on laptops, desktops and mobile devices is among a company’s most valuable data even while it’s potentially at the greatest risk. According to IDC there were some 1.3 billion mobile workers in 2015. However, only half of enterprises today are using some type of endpoint backup. That means that the volume of endpoint data that is in jeopardy is nothing short of significant. 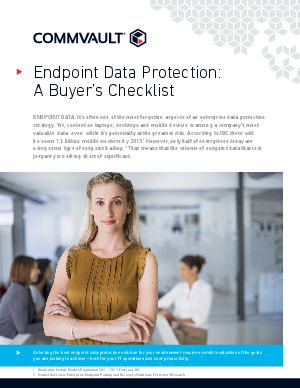 Download to read the buyer's checklist on endpoint data protection!